What are Market Makers and ECNs? Have you ever wondered where your trade goes when you place a buy or sell order? Although most equity trades take place on centralized exchanges, these exchanges rely on intermediaries to match buyers and sellers and to serve as counterparties for every trade. These intermediaries – market makers and electronic communications networks (ECNs) – are central to keeping the stock market liquid as well as to determining what price you’ll pay when buying a stock and what price you’ll receive when selling a stock. This article will explain everything you need to know about market makers and ECNs and how they differ in the process of trading. When trading stocks, every buy order needs to be matched with a sell order and vice versa. This can be done through a brokerage, which matches orders among its own clients, or through a market maker or ECN. 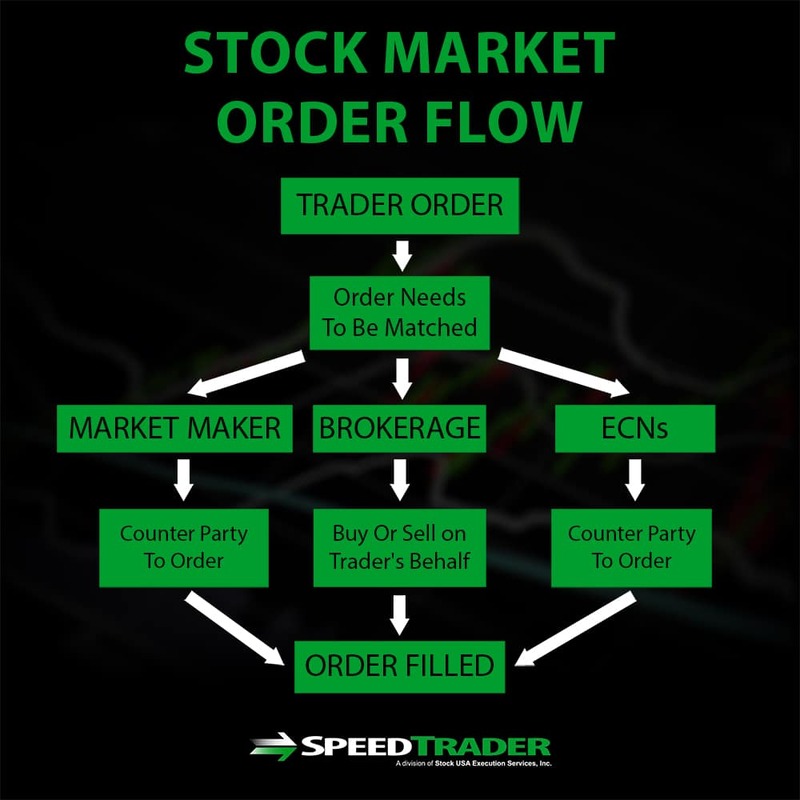 The difference is that market makers and ECNs will actually buy or sell stocks, serving as the counterparty for your order, whereas the broker simply buys or sells on your behalf. For stocks that have relatively little trading volume, the existence of market makers and ECNs who can serve as counterparties for trades vastly increases the volume of trading that takes place on an exchange. Market makers and ECNs match buyers and sellers in multiple steps and serve as the counterparties for every transaction. That means that market makers and ECNs either buy or sell equities directly from or to you, then balance your order by finding another buyer or seller with whom to trade. 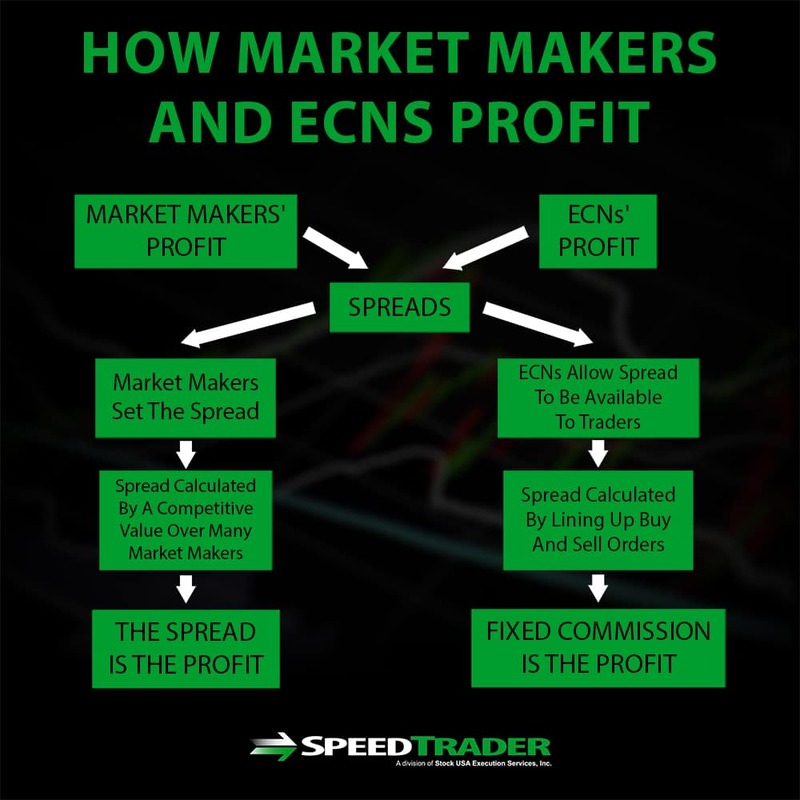 Both market makers and ECNs work similarly in that they rely on spreads, the difference between bid and ask prices, to make money off of trades, but the way they calculate spreads is very different. 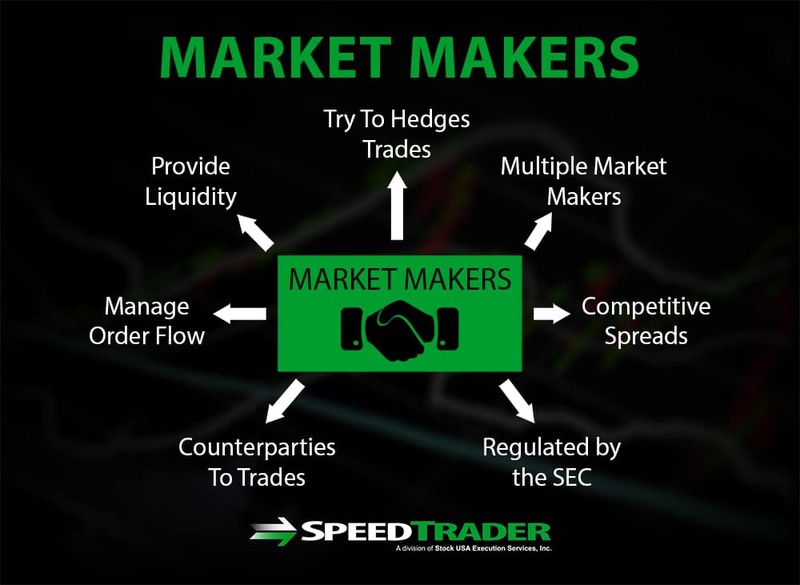 Market makers set the spread for each stock, although these spreads are competitive since there are typically many market makers offering trades. 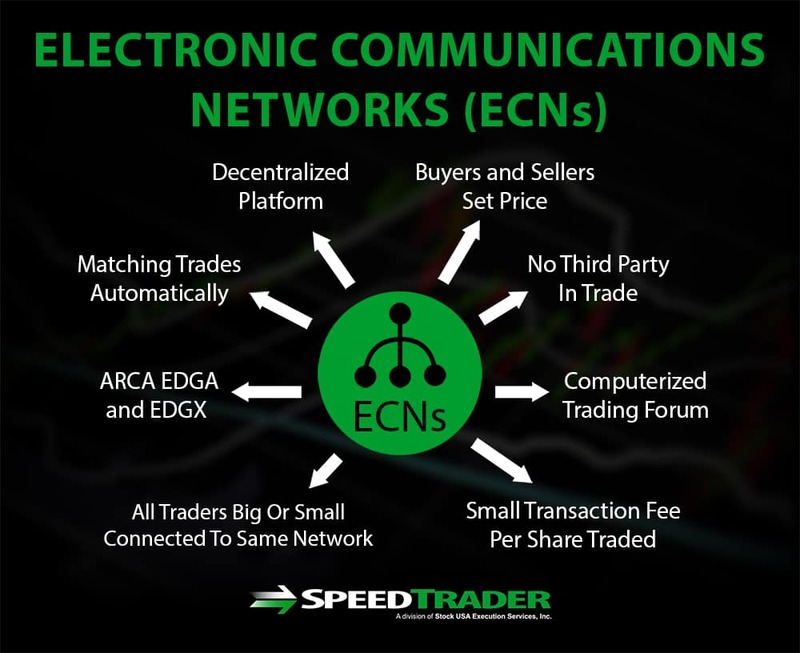 ECNs, on the other hand, serve as a central location for displaying bid and ask prices from everyone connected to the network – the ECN itself does not set prices nor profit off the spread. Instead, ECNs typically charge a fixed commission fee per trade in return for serving as the counterparty for every trade. A market maker is a broker that sets the bid and ask prices for a set of stocks and buys or sells stocks from their clients. Market makers typically try to hedge by passing your trade on to another client opposing your trade and profit off the spread or try to bet against you to profit off changing stock prices. Since market makers set their own prices for stocks, a single stock may have different bid and ask prices or spreads at different market makers. The primary roles of a market maker are to provide liquidity and to manage order flow. The ability of market makers to serve as counterparties for their client’s trades allows clients to buy and sell stocks without having to match to another buyer or seller. As a result, the market for that stock is much more liquid, allowing the volume of trading to increase so that there is more money invested in the market overall and available to companies as capital. Market makers are also responsible for managing clients’ order flows – in fact, many brokerages are also market makers. Essentially, market makers will fulfill buy and sell orders, as well as match buying and selling orders between clients so that the market maker itself is not always betting against either client. Most brokers who work for broker-dealers are also the primary market makers in the major exchanges. Some market makers cater specifically to large clients, such as other banks and trading firms, while other market makers are open to retail traders. Market makers make money primarily by profiting off of the difference between the bid and ask prices, or spread, for a stock. This is essentially the difference between the price at which the market maker is purchasing a stock and the slightly higher price at which they are selling it to you. Conversely, market makers may buy a stock from you and sell it at a slightly higher price. When trading in high volumes, these marginal gains add up to significant sums. However, since market makers are typically competing against many other market makers and ECNs for a single stock, spreads remain competitive. How are the Market Makers Regulated? Market makers are regulated by the Securities and Exchange commission. Market makers are required to be able to buy and sell a minimum volume of shares of any stock they make a market for, typically 100 shares, and to publicly display bid and ask quotes that are updated at a set frequency. A market maker’s commitments also include stating how it will operate under a wide variety of market conditions so that their response during a panic does not lead to market collapse. There are a number of common market makers, each with different specializations. NITE – Knight Securities is one of the most popular market makers in the penny stock market. ETRF – G1 Execution Services LLC was once part of E-trade and is a common market maker for retail stock traders. VFIN – Vfinance Investments is a market maker for over 6,000 major stocks traded on popular exchanges like the New York Stock Exchange. VNDM – Vandham Securities specializes in small-cap stocks and illiquid securities. CDEL – Citidel Securities is one of the largest market makers in the world for fixed income and options trading. An ECN, or electronic communications network, is a decentralized platform for matching buyers and sellers without going through a third party like a market maker. ECNs serve essentially as a computerized trading forum, connecting all of the buyers and sellers for a stock and matching them automatically. Like market makers, ECNs display bid and ask prices for every stock being traded, but unlike market makers, prices in an ECN are set by buyers and sellers themselves. ECNs function by reading in the bid and ask prices for a given stock offered by all traders – whether retail investors, institutions, or both – connected to the network. When bid and ask prices are matched, the ECN executes a trade between the two parties involved. This system means that the bid and ask prices displayed on an ECN are set not by the ECN itself, as is the case for market makers, but directly buy buyers and sellers. Instead of profiting off of the spread for a stock as market makers do, ECNs make money by charging a very small transaction fee per share traded. ARCA – This ECN is where a large volume of trades placed on the New York Stock Exchange are now routed through. ARCA specializes in exchange-traded funds and holds over 20% of the US market for these funds. EDGA and EDGX – Both of these ECNs are owned by Direct Edge and are now considered full-fledged exchanges under SEC rules. Although not as large as ARCA, they offer trading of many of the same equities. The path of a trade, once placed, is complicated and depends heavily on the inner workings of market makers and ECNs to match buy and sell orders. Their rapid, high-volume trading allows equities to remain liquid and they are critical to managing order flow within exchanges. Whereas market makers set the bid and ask prices for a given stock and profit off the spread, ECNs profit by charging a small transaction fee while individual buyers and sellers ultimately determine prices.